RAM disks are available since 1979. They offer a filesystem in RAM and therefore outperform most of all other storage systems. This can be used to do disk intensive operations in a fraction of the normally required time. This article covers Mac OS X 10.5 and later. If you STILL use earlier versions take a look at the article posted by OSXDaily. Be aware that the content of a RAM disk is permanently deleted as soon as it is ejected! Only use it as temporary storage! To simplify the process I created RAMDiskCreator. It’s a freely available tool and offers a graphical user interface for the RAM disk creation. Only the size and the volume name have to be provided. In the background the same command is used as described above. You can download RAMDiskCreator 1.4 for Mountain Lion or better here. If you are still on Lion or Snow Leopard please download RAMDiskCreator 1.2. Furthermore I will happily provide the source code on request. Hi ! I want to ask once you have created your RanDisk how do you use it. Will you D&D appls there or the OS will use it automatically ?? Thank you for some help!! Ram Disks are essentially just a special type of volume or drive. They show up in Finder and behave like for example a USB flash drive. You can use them to temporary store any kind of data. Nowadays they are primary used to speed up disk intensive workloads where SSDs are to slow. Based on your question I’m not sure they are the right tool to solve the kind of problem you face as they have several disadvantages. This leads me to the most important question: What problem do you face? Interesting script, thanks! Why the RAID striping though? Will it use multiple memory channels so it is even faster? Based on your question I’m pretty sure that my tool is not the correct answer to your problem. I guess you are trying to speed up your computer? If I’m correct I would suggest you to get an SSD. It will cost you between 100 and 200€/$ and your computer will feel like a new one. A RAM disk is not really built to storage applications. Whenever you reboot everything stored in it is lost! The clear message is: Don’t store your applications on it except if you fully understand the risks associated! The right solution for your problem is a SSD. RAMDisk Creator is great, and I used it a lot for the last few months to make saving faster. Word, Excel, PowerPoint, and GraphicConverter are particularly slow at saving files to my hard disk, and it’s much faster to use a RAM Disk. The problem is that I had to back it up regularly to disk. Thanks to the terminal command you showed here, I wrote an app to automatically back up files from the RAM disk to the hard disk every 5 seconds (customisable). It’s open-source, and I’d appreciate it if you could link to my website! Thank you! could we choose a default of our own, e.g. 4 GB in a future version–or separate app as shareware with that option. That’s a very good idea! The application now remembers your last used settings! Should be exactly what you want! Just download version 1.3 of RAMDiskCreator. Thank you for a good job done!!! Hi, i use this to create the ramdisk, one question, is posible to remove the ramdisk without reboot? there are a command that removes the ramdisk from memory and let this memory free but without the need of reboot?? Sure, just unmount the ram disk as you would do it with an external usb drive before unplugging it. I have done something similar before using a shell script that creates the ramdisk etc. But my main intention was to be able to move the chrome cache (located at /Library/Application Support/Google/Chrome) to the ramdisk. Using the union-flag and some scripting you could even make the cache be persistent even on reboots yet maintain the speed of the ramdisk. But when closing the lid, or letting my macbook go to standby the ramdisk gets unmounted and there is no stable way as far as I know to prevent this, or even to make a script run on shutdown to copy the files of the ramdisk to the original location. Any idea how this could be made possible? I know using a modified version of Chrome it’s possible to have no file-cache at all, only ram-cache, but this does require the cache be rebuilt every time you launch chrome. and i got a 1tb ramdisk! try it out works 100% unless typed in wrong. can be used to store videos then upload to youtube via ramdisk. This is a hidden secret that Mac wont tell people about So do it Now! p.s. sometimes the RamDisk disappears when restarting or shuting down the mac, if it happens just do the same command and you will get it back. Hope you enjoy! Your command works however it’s not a good idea to use it! 1.) Your command will create a RAM disk with a size of 1TB. However I’m pretty sure you don’t have 1TB of RAM. Therefore content has to be moved from fast RAM to slow disk (this is called swapping). As soon as you copy more data into the volume than RAM is available some parts of your main memory will be written to disk. This will affect the performance of your system, as important data has to be fetched from a slow spinning disk instead of the main memory! 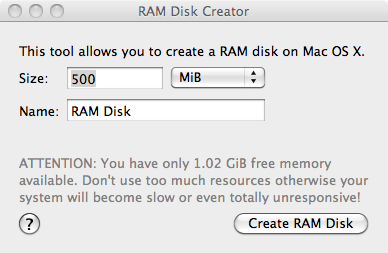 That means it is not a good idea to create a RAM disk larger than the available RAM. 2.) Be aware, that the content of the RAM disk is permanently deleted after unmounting it! That means it can’t survive a reboot! If you only talk about the plain volume, you can create a small AppleScript to create if for you at login automatically. Hey Florian, a quick question. The app tells me I have 1GB RAM available, although the Activity Monitor shows much more (18GB available). Any ideas on why this might be? This was a bug! It’s fixed and now the free memory should be correct! Wouldn’t the ramdisk data length be more appropriately measured in page sizes of a “sector” rather than a page itself? Though pages can be used to denote blocks of any type of memory, it’s more connoted towards address space divisions that are variable on different paging modes. So I was slightly alarmed when heard the word pages, thinking that I’d have to go and see what my current system’s page size is. Thanks for the advice – You are completely right!